1840 Thomas Powell sunk the first deep mine at Cwmbach, Aberdare. 1840-1863 He opened many further deep mines, both in Aberdare (Cwmdare, Abernant, Abergwawr, Middle Duffryn and Cwmpennar) and in the Rhymney Valley. At their peak these collieries produced over 400,000 tons of coal each per annum. 1863 Thomas Powell instructed T. E. Forster, William Armstrong and George Elliot (Later to become Sir George) to put a valuation on all his collieries. 1864 As a result, George Elliot formed the Powell Duffryn Steam Coal Co Limited (PDSC) for the purpose of working the whole of Thomas Powell's collieries. At this time the wealth of the South Wales Coalfield was only just being realised. 1867 The PDSC bought the Aberaman Estate from the iron master Crawshay Bailey. The acquisition of the Aberaman Estate was an important purchase, as underneath lay some of the best steam coal in the world and all within easy access to the ports. Aberaman became the headquarters of the company. 1914 The market in France was so large that they registered as Compagnie Francaise des Mines Powell Duffryn, with their main offices at Rouen. 1916 An able businessman, E. M. Hann (who had started his career in the company in 1879) was made director of the PDSC and enabled the company to become the greatest coal-producing company in the world. 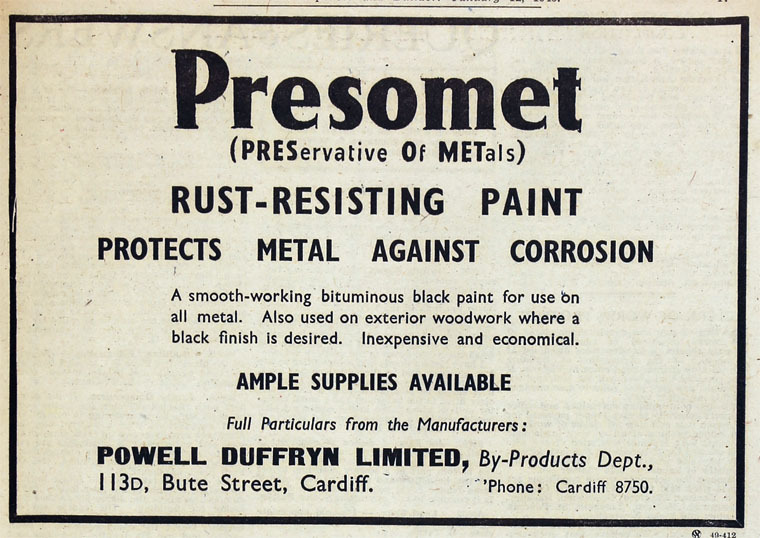 1935 Powell Duffryn Associated Collieries was registered with the amalgamation of the PDSC and Welsh Associated Collieries. 1942 Amalgamation of Powell Duffryn Associated Collieries with Cory Brothers and Co.
1944 Formation of Powell Duffryn Ltd and voluntary liquidation of the 3 former companies. 1946 Unlike the main coal production business, several subsidiaries were concerned with fuel distribution, and so would not be nationalised - these were Stephenson Clarke Ltd, Gueret, Llewellyn and Merrett Ltd, Cory Brothers and Co Ltd. Powell Duffryn and International Combustion Ltd jointly established Rhymney Engineering Co to take over an engineering works at Rhymney that Powell Duffryn had been operating during the war. The company would manufacture mining machinery, materials handling plant for collieries and power stations, and other specialised engineering products. Delanium Ltd had developed a new method of making carbon. 1950 Vacuum Oil Co acquired the oil storage, blending packing business at Coryton of Cory Brothers and Co in exchange for shares in Vacuum Oil Co which would be held by Cory's parent Powell Duffryn; together with further investments, this would give Powell Duffryn and Socony-Vacuum Oil Co Inc of USA equal ownership of the Vacuum Co. An oil refinery would be built at Coryton, primarily for the production of lubricating oils. 1959 Cory Brothers acquired MacCleaster Chemical Co, maker of anti-corrosion chemicals for ships. Formation of Powell Duffryn Timber Industries Ltd to bring together all of the timber interests. 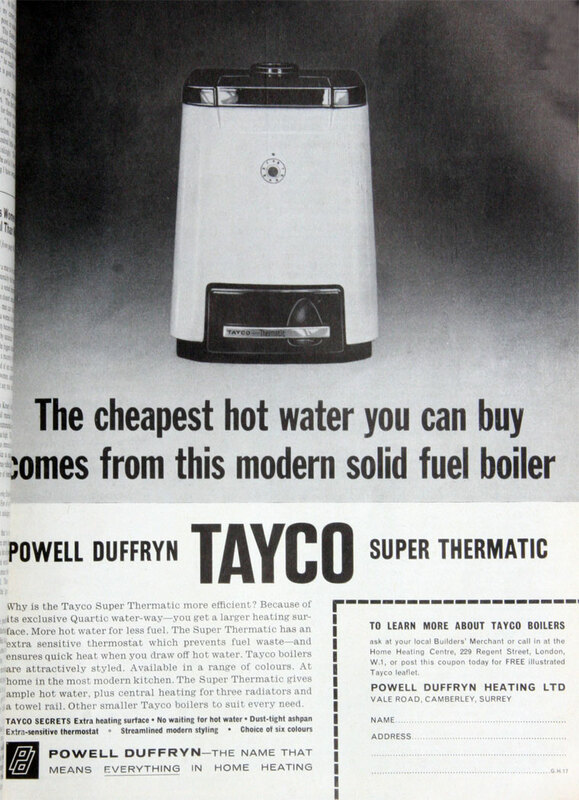 Established Powell Duffryn Modulair to make heating and air conditioning plant. 1976 Acquired an interest in Humberside Holdings, provider of port services around the confluence of the Humber, Trent and Ouse. By the early 1980s, the company had worldwide recognition in the field of engineering, shipping (travel), bulk liquid storage, fuel distribution, construction, wagon manufacture to name but a few. In 1980/81 the turnover reached £456m. 1984 Hanson Trust made an unsuccessful take-over bid. 1990 Tried to sell the coal distribution business but failed to attract attractive offers. This page was last edited on 7 July 2017, at 13:57.